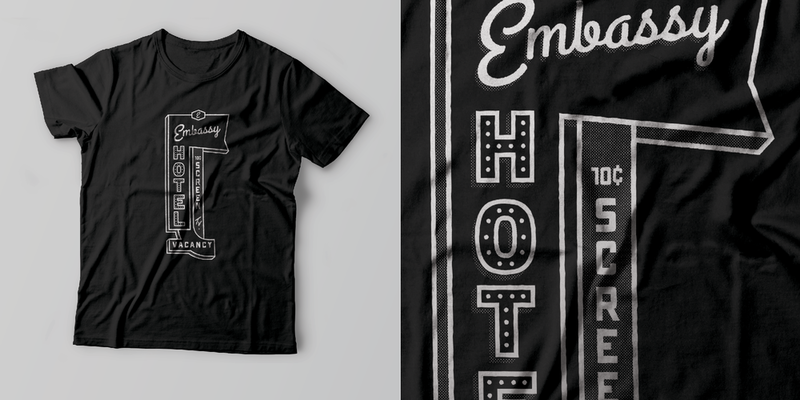 We’re honouring our hometown (London, Ontario) with a series of limited run t-shirts celebrating local landmarks, past and present. To kick off the series, we’ve got the long standing Blackfriars Bridge and the gone-but-not-forgotten Embassy Hotel. The Embassy Hotel was built in the 1900s and was operated solely as a hotel up until the early 80s. Around that time, they began offering live music for entertainment. The Embassy became a staple in the art and music community, and thousands of music acts played its stage. Sadly, in 2008, the Embassy caught fire and burned down. Although all that’s left is an empty lot where it once stood, many Londoners still have fond memories of the venue. Since 1875, Blackfriars Bridge has carried Londoners over the winding Thames River. A historic structure in London and area, the bridge still operates, although only as a pedestrian crossing. The bridge’s silhouette floats over the river and has inspired numerous artists' representations over the last 141 years. Designs are printed on Bella + Canvas brand shirts & available in XS, S, M, L, XL, 2XL, 3XL sizes.